Rakshabandhan is a special day celebrated by brothers and sisters. Its that time of the year when brothers get fed sweet stuff and sisters get a present. In the olden days while tying the rakhi, sisters usually fed their brothers a piece of jaggery or sugar lump. Then it progressed to laddoos and barfis. Nowadays most brothers shy away from ghee laden sweet stuff and instead prefer chocolates. Unfortunately this rakshabandhan I will not be either in London or Nairobi to feed my brothers some yummy home made chocolates. 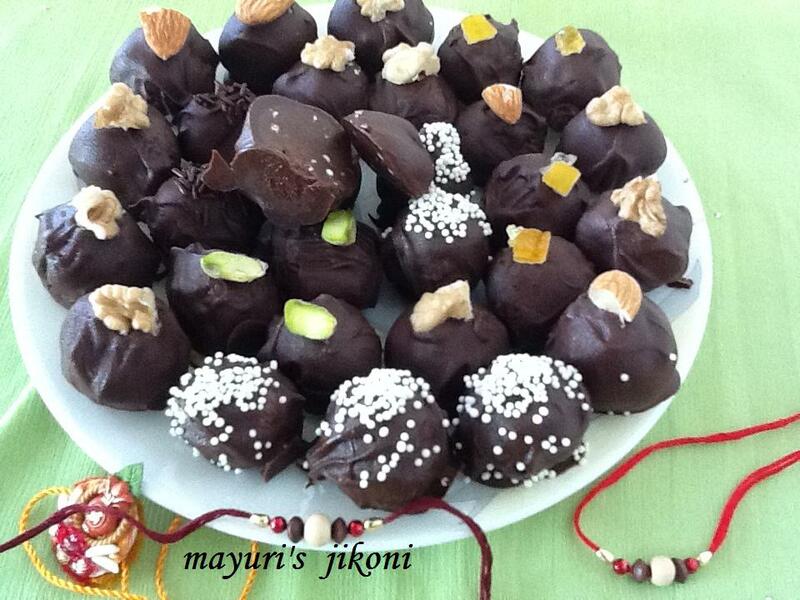 Sorry, no cannot post them either as they may not get past the post office workers here, or have a brilliant idea, pass on the recipe to my lovely bhabhis and they may make them for you 🙂 So though I have made these chocolates for real, I am sending them virtually to you. Enjoy the day and May God bless all of you with good health, peace and happiness. Sieve milk powder, cocoa and nut powder together. Mix water and sugar in a heavy bottom pan and boil it till it becomes a thick syrup about 1 thread consistency. Add the butter and mix till it melts. Add the extract and milk powder mixture and mix well. Let the mixture cool for a while. Take teaspoon full of the mixture and make it into round balls. You may need to occasionally grease your hands with butter. Put chocolate in a small bowl. Place the bowl in hot water which is simmering in a pan and mix the chocolate till it melts. Remove the pan from the heat. Dip one ball at a time in the melted chocolate. Using a fork, remove the ball from the chocolate, gently shake it so the extra chocolate comes off and place it on the lined tray. Repeat with the remaining balls. Top each chocolate with a nut, sprinkles, orange peel, cherry etc. Put the tray in the fridge till the chocolate sets. Instead of rolling into balls, can pour the mixture into a greased tray.Pour melted chocolate over it and let it set. Cut into squares. Use any flavouring of your choice. You can use only milk powder if you want. Can use only milk chocolate if preparing for little kids or just dark chocolate. One thread consistency… place a small amount of syrup on a saucer. Take it with your finger and press it with your thumb. Open it. If you can see a string then thats one thread consistency. If you cant see the thread, let the syrup cook for a further few minutes. Usually it takes only 5 minutes or less to make the syrup.